Holly & Shamrock Parade kicks off Celebrate Santa Festival in Gatlinburg. Santas with reindeer, with a part-wolf, Santas on motorcycles, Santas playing bagpipes and Father Christmas all took part in the Holly and Shamrock Parade in downtown Gatlinburg on Saturday. The event kicked off the annual Celebrate Festival that runs through Tuesday. ...you or a loved one gets sick before you leave for your Pigeon Forge trip? ...you need medical treatment while traveling? ...you've lost your job or have been laid off? ... you need roadside assistance or need your vehicle returned to your primary residence? The new Titanic Museum Attraction in Pigeon Forge will be opening in April. The Titanic's crew & exhibit are sure to edutain young & old alike. This 1st class attraction is the 2nd installment of the Titanic with the 1st being in Branson, MO. The creators of the Pigeon Forge museum attraction have strived to recreate the maiden voyage from the famous grand staircase to original accounts & experiences of passengers & crew. The museum experience should inpire young passengers through interactive exhibits as they learn how the Titanic was built & the history of the ship & its passengers. The Titanic Pigeon Forge truly will be a must see exhibit. Maiden Voyage April 8th, 2010. All Aboard. 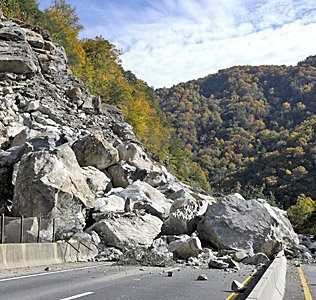 Be Advised: There was a massive rock slide at the Tennessee-North Carolina state line on Saturday October 24, 2009. Detours have been established. Drivers traveling from Tennessee to western North Carolina via I-40 are advised to take one of two eastbound detours. The Tennessee Highway Patrol (THP) recommends traveling east to North Carolina via I-81 to Johnson City, then taking I-26 to Asheville. Drivers in normal passenger vehicles can also take Highway 25-70 from Newport into North Carolina. Visitors to Gatlinburg can also follow HWY 441 through Great Smoky Mountains National Park to Cherokee and take HWY 19 through Maggie Valley to access 1-40 in North Carolina. Note:The Tennessee Department of Transportation has begun a major project along Highway 66 (which could make traffic a bear). Get more info about the road construction and utilize less-traveled and scenic routes to Gatlinburg (to ensure an enjoyable trip through the Smokies).